Following the sudden May 2011 resignation & subsequent departure of the presding Bishop Seicho Asahi, the Los Angeles Koyasan Buddhist Temple recently welcomed it's new Sensei Keishin Kako from Japan on September 1st 2011. 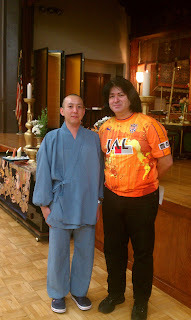 Kako Sensei has since formally assumed his duties as the new presiding Sensei at the Koyasan Betsuin in Little Tokyo. Though his English is quite limited, he is quite personable and very approachable. Kako Sensei is both young and energetic but do not let his 23 years fool you. He is bright and learned well beyond his years. He has achieved a level of mastery of Shingon Buddhism and is most eager to assist and answer any and all questions one may ask of him. We are pleased to say Kako Sensei is one of the most friendly Sensei's we have met and has instantly made a distinct impression on the Koyasan Temple. We at American Mishima wish him great success.